Second gen 2 in / 2 out USB 2.0 audio interface with one Scarlett mic preamp & one instrument input. Scarlett Solo S is class compliant on Mac. Driver will be required for PC. 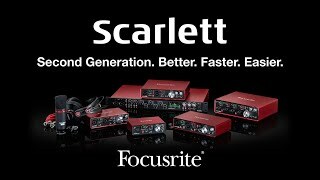 With the Scarlett Solo USB audio interface, your recordings will sound just how you want them to. Plug straight in to record your guitar and vocal simultaneously on independent channels so they can be mixed separately. The super-low latency* brings confidence to your performance, letting you record and monitor with software effects in real time. Connect your headphones and home speakers or studio monitors, turn up the volume and totally immerse yourself in sound. Compact and portable enough to take anywhere, you won't even need a power supply; Scarlett Solo is connected and powered by a single USB cable. It also comes with the software and effects you need to start recording; an exclusive version of Pro Tools | First Focusrite Creative Pack (featuring 12 additional plug-ins including the Eleven Lite for real life guitar amp emulations), Ableton Live Lite, the Softube Time and Tone Bundle, Focusrite's Red Plug-In Suite, 2GB of Loopmasters samples and more. 2 in / 4 out USB 2.0 Audio interface with two Mic/Instrument preamplifiers, 24bit/192kHz, USB Bus Power. Second generation 2 in / 2 out USB 2.0 audio interface 24bit/192kHz & USB bus powered.